WASHINGTON — House Majority Whip Steve Scalise was among at least four people wounded Wednesday morning when a gunman opened fire during a congressional baseball practice at an Alexandria, Virginia, park. The Republican lawmaker was transported to MedStar Washington Hospital Center in Washington, D.C., where he was in stable condition and undergoing surgery. Scalise was injured in the hip. A statement from Congressman Roger Williams' office said the Texas Republican was not wounded, but a member of his staff was shot and taken to the hospital. "Please keep the member of my staff and all members of the congressional baseball team in your thoughts and prayers," Williams tweeted. '"It's an active scene. We're having a lot of people to interview," Brown said. Multiple law enforcement officials with knowledge of the investigation told NBC News that at there was no immediate indication that the shooter has ties to international terrorism. Both Democratic and GOP members of the House and Senate have been using the baseball field each morning in Alexandria's Del Ray neighborhood in preparation for a bipartisan game scheduled for Thursday. The Democrats had reportedly practiced earlier in the morning. Thursday's game was supposed to honor the victims of recent terror attacks in Manchester and London. Sen. Rand Paul, who was at the batting cages at the field, told MSNBC that Scalise as a House leader always has Capitol Police with him as security detail. Scalise has represented Louisiana's 1st District since 2008. It was not immediately clear if the wounded officer was part of Scalise's detail. Last edited by Molly on Wed Jun 14, 2017 10:45 am, edited 1 time in total. 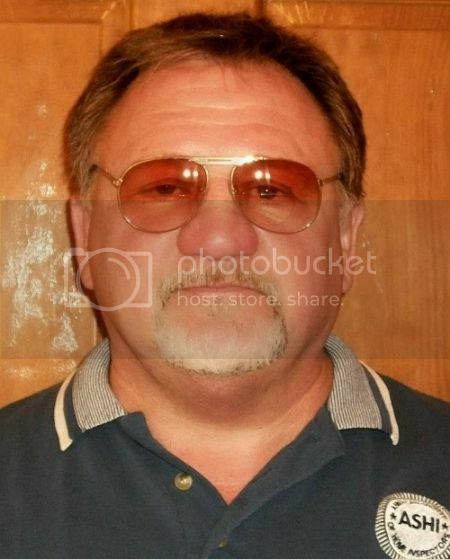 Shooter has been identified as James T. Hodgkinson, 66, white male. IF this is the same person on FB, he is from Belleville, IL. This is a direct result of the Trump is Hitler narrative that has been so scurrilously pushed by Comey, Clinton, Pelosi, Waters, McCain, McCain, McCain, (did I mention the evil McCain) the entire Never Trump cabal, the entire DNC, the MSM court jesters, et al. A man came to kill these men because he has believed a lie promoted by their evil words. Thank God Scalise’s security detail was there. If not there would have been a far worse massacre. Rodney Davis (R) was there and he is saying it is a result of “Political Rhetorical Terrorism.” Amen Davis, preach. It will be interesting to see if the Democrats on Capitol Hill continue supporting political violence against President Trump and Republicans now that their supporters have started shooting people. They will blame Trump ...... and guns. They need to classify "Liberalism" as a psychiatric condition. And declare The Democrat Party to be a Terrorist Organization. Seriously... supporting Bernie is a sign of ignorance, low IQ, likely psychiatric problems. ALL Bernie supporters need to be watched.. maybe caged. James Woods is on fire on twitter today. 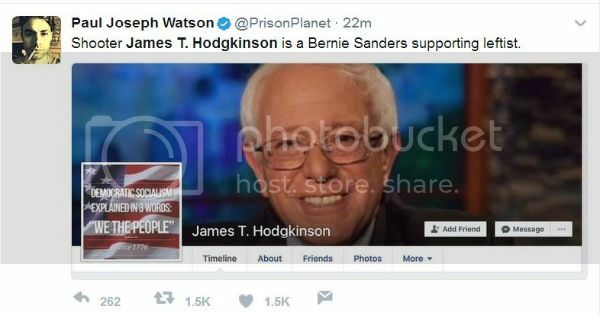 James Hodgkinson, 66, died from gun injuries on Wednesday hours after he opened fire on a group of Republican congressmen and their aides who were practicing for a congressional baseball game in the Washington, D.C. suburb. Rep. Steve Scalise and four others were injured, and all are in stable condition. Hodgkinson, who is from Illinois, had been living in Alexandria for the past few months before the shooting. He frequented Pork Barrel BBQ, a local bar near the baseball field, often stopping in during happy hour or to watch golf games. This sort of incident is EXACTLY what the left want.. they continue to clamor for it. "Resist" is code for violence. Throwing bricks and firebombs at people is an attempt to injure, likely kill. The use of a gun is not really any different in intent and savagery. All of the people on the Left are PLEASED about this attack. Some mouth platitudes, but they still have the same mindset... violence is not only OK.. but is required.